Lower Wharfe CC’s slalom training site, located about 12 miles east of York. There are now 3 sections at Howsham Weir available for slalom training: The Weir, The Narrows and The Mill Race. When using the site, parking is downstream of the weir by the road bridge or in the small car park. Get in either side of the bridge and paddle up to the weir. There is a public footpath either side of the river for non-paddlers. LWCC main training nights are on Tuesdays and Thursdays at 6:30pm during summer daylight saving times and floodlights are planned to go onto the Mill Race to give year-round training. 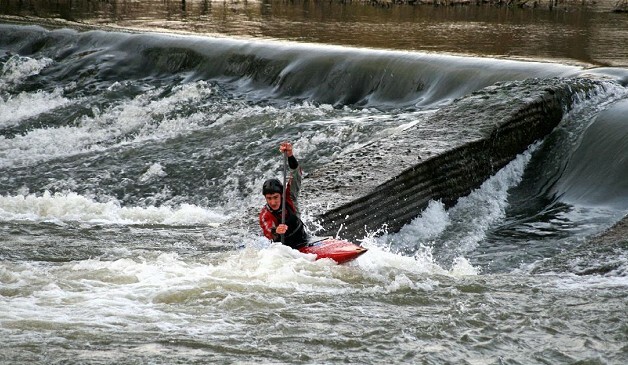 Howsham Weir is Lower Wharfe CC’s slalom training site. It is located about 12 miles east of York. There are now 3 sections at Howsham Weir available for slalom training: the Weir, the Narrows and the Mill Race. The weir itself is about 150 metres long with an angled drop about 8 metres long in low water. There is a chute in the weir built in for canoeists. In high water the weir gives a playful stopper along its length but the chute is just a back-end breaking big hit of a stopper. In low water the chute produces narrow standing waves with sharp eddies either side that makes for quick reaction crosses. There are no permanent gates on this section. Below the weir where the river narrows there are a number of permanent single poles hung from trees on both sides of the river. This section is flat flowing water with usable eddies. On training nights bearers are put across to add extra gates. Where the water flows through the mill’s water wheel into the Mill Pool it creates a flow with standing waves with powerful swirling eddies. This then flows into the mill channel that flows into the main river at the bottom of the Narrows section. The flow through the wheel can be regulated from the mill. There are permanent gates on this section. After training the gates must be pulled back to the sides. Link to video of the Mill Race section: http://www.youtube.com/watch?v=a1BQkqbCHjM. At the level when the video was taken the Mill Race is a little bit washed out. The lower the water the more difficult the course is. When using the site, parking is downstream of the weir by the road bridge or in the small car park. Get in either side of the bridge and paddle up to the weir. There is a public footpath either side of the river for non-paddlers.